In these times of competitive fundraising when nonprofits are vying for the attention of donors who have multiple with asks and events, leveraging innovative strategies is key to success. The good news is there is a rising new group of givers: Social Donors. Social Donors are supporters who give at fundraising events and through peer-to-peer campaigns such as sponsoring someone in a fundraising walk or ride, or donating to a viral challenge. These new donors are a growing force in philanthropy, accounting for nearly 25 percent of the U.S. Adult Giving Population — or 58M potential donors. Yes, we said 58M givers! 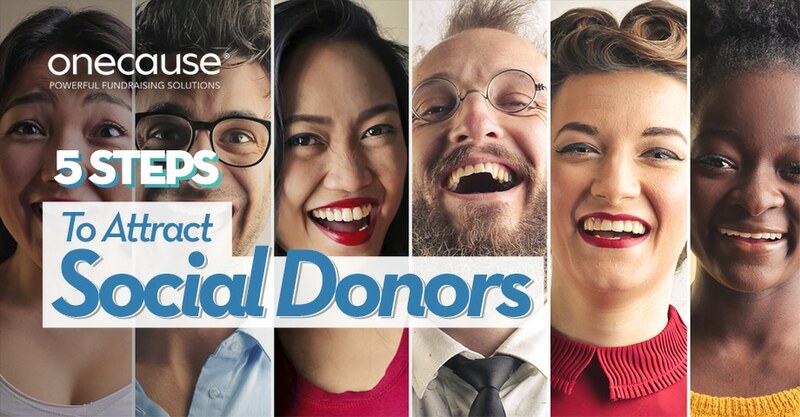 According to a recent study conducted by OneCause, Social Donors have very different motivations for giving compared to other donor audiences, as well as clear expectations about what it takes to stay connected to an organization. Between 31 and 49 percent of Social Donors are first-time supporters. There is a huge opportunity here for organizations to tap into a completely new donor pool. With an average donation of $198, Social Donors represent a group worth seeking out. Nonprofits should remember, however, that new donors don’t have the same background and familiarity as existing donors. First-time donors need more mission connection, impact statements, and inspiration to capture their donations. Social Donors hear about events and campaigns from, you guessed it, their social networks. We know that a personal recommendation or introduction to a fundraiser is the top way Social Donors hear and get involved in events and campaigns. One strategy to fully leverage Social Donors is to incorporate Ambassador Fundraising into your fundraising. Ambassador Fundraising takes your most ardent supporters and turns them into active fundraisers. If you’re hosting an event, appoint Ambassadors to act as the faces of your organization. These Ambassadors can help sell tickets to your event, find and onboard sponsors, advertise and recruit Social Donors from their own networks and fundraise leading up to an event. Tapping into Ambassador Fundraising allows your team to fully tap into the giving motivators of Social Donors, their social circles and networks. While some donors enjoy recognition for their efforts, that isn’t necessarily what drives Social Donors. This group of donors cares more about understanding the impact of their donation than public recognition or thank you’s. As you’re creating a donor follow-up strategy for your campaign, you might have to take a step back and re-examine what message you’re leading with what Social Donors care most about. For Social Donors, it’s important to move beyond recognition into mission and impact, to help increase engagement. 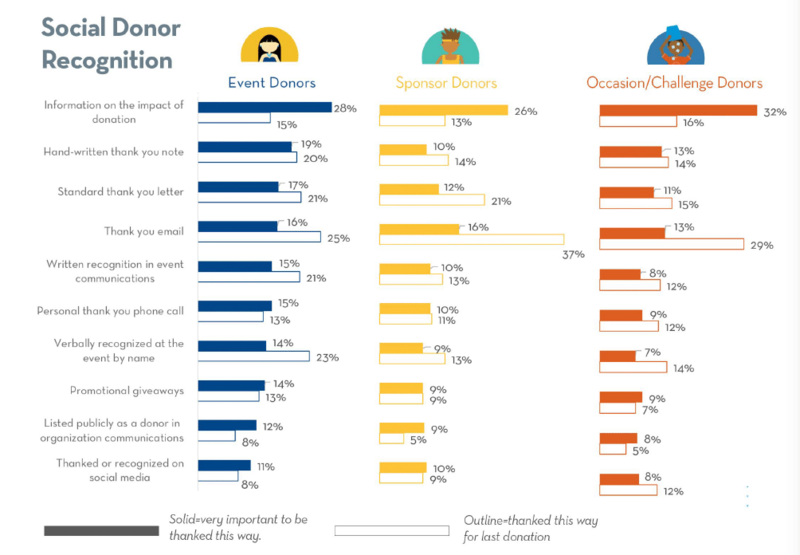 The below chart shows how Social Donors want to be thanked versus how they are being thanked today. As any nonprofit marketer knows, it can be hard to avoid buzzwords in promotions and campaigns (after all, they’re cliche for a reason!). But, when it comes to Social Donors, you only have a few precious seconds to make up a person’s mind about whether or not they should donate to your cause or campaign. Instead of relying on fundraising buzzwords, try to hit on that deeper connection – think mission messaging! Go beyond taglines and hone in on why your organization exists, how you’re planning on utilizing these incoming donations, and what your overall impact is in the community or larger world. It’s is also important to connect Social Donors back to the personal connection that brought them to your cause and campaign. Let Social Donors feel the ‘Why’ of your organizations and the donations will follow. Beyond mission messaging your donation process must be easy! Social Donors are motivated and activated to give to nonprofits who make giving simple. Be sure to evaluate your traditional and technology powered giving opportunities through the eyes of a Social Donor. You need a seamless giving experience in order to capitalize on Social Donor giving. Because Social Donors are varied in demographic scope, it’s important to know who you are targeting. Take Event Donors, for example. This specific group of Social Donors makes their biggest donations in the form of buying an event ticket or participating in a raffle at an event. They’re not really known for donating online or participating in a P2P campaign. Instead of spinning your wheels with a social campaign for this audience, it’s probably a good idea to double-down on your mobile auction and event offerings. Sponsors Donors, on the other hand, are all-in on P2P and social campaigns. Because they sponsor participants in social activities such as walks, runs, and rides, social media campaigns are the best way to draw them in and encourage donations. For Occasion/Challenge Donors, it’s the thrill of winning that draws them in. Leaderboards, social updates, and donor check-ins coupled with campaigns using gamification and competitive giving elements are key. Map out how your current campaign strategy approaches new and first-time donors to ensure you’re covering all your bases. Identify and equip Ambassadors with the tools and resources they need (including a unique microsite!) to operate successfully. Do a quick headline audit of all your content, from social to email to web, to ensure you’re leading with the mission and impact. Identify areas where you can re-configure your message to make it more personal and mission-focused, and then execute these changes. Build out your audience-specific campaigns, including social media, P2P, online, and email, depending on your unique target segment. Simplify the giving experience by replacing manual donation processes with automated tools. Even for those already using fundraising technology, be sure to check for easy click giving, minimal steps in donation process and prominent calls-to-action throughout your giving pages and tools. Who Are Social Donors? Check out our all you need to know about Social Donors and what makes them tick and stick. 6 Levers for Social Donor Conversions. Learn more about what it takes to increase your likelihood of turning Social Donors into regular givers. Why the Giving Experience is so Important to Social Donors. Explore how to optimize your giving experience to capture more Social Donors.